Great Barrington Town Hall is located at 334 Main Street, Great Barrington, MA 01230; phone: 413-528-1619. Photo: Searles Castle, ca. 1880s, Main Street, Great Barrington, MA. 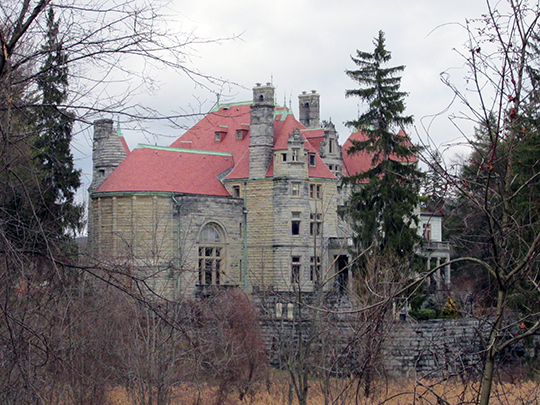 Listed on the National Register of Historic Places in 1982. Photographed by User:John Phelan (own work), 2012, [cc-by-3.0 (creativecommons.org/licenses/by/3.0)], via Wikimedia Commons, accessed July, 2013. In 1761 the town was incorporated (being taken off from Sheffield) under the name of Great Barrington, so named in honor of Lord Barrington, of England, "the first of the name and peerage of Barrington." Its prefix "Great" was obtained, it is said, from the following circumstance — the divisional line between Massachusetts and Rhode Island was unsettled and in controversy. The Town of Barrington, now in Rhode Island, lay near the disputed line, and had been, in some degree, subject to the jurisdiction of Massachusetts; but as it was uncertain whether, by adjustment of the line, Barrington would fall within Massachusetts or Rhode Island, and to obviate the possible impropriety of having two towns of the same name in the province, it was determined that the new town should be called Great Barrington. The principal streams within the town are the Housatonic, Williams and Green rivers. The town is cut by mountain, hill and valley, a magnificent piece of scenery, the most attractive of its many points being Monument Mountain, extending from the northern part of the town into Stockbridge. Hamilton Child, Gazetteer of Berkshire County, Mass., 1725-1885, The Journal Office, Syracuse, N.Y., 1885.